With his spirited horse and his spurs clearly in use, The Carpetmaker wears a richly patterned cobalt blue tunic with a fine, wide cuff detail. He also sports one of our favourite hats, which was designed after very brief visit to a museum in Perugia, Italy. We discovered a series of medieval tapestries there and were so inspired with new ideas that we filled up an entire sketchbook with hasty scribbles. 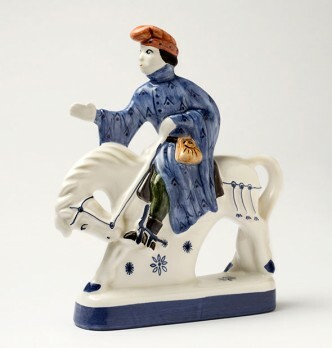 Each figure in the Canterbury Tales range is designed to work as a standalone figure or as part of a wider collection, but alongside the other guildsmen and their partners The Carpetmaker was conceived to pair perfectly with his Wife so there are a series of subtle decoration details that echo between the couple.